The sign above the Reeves Center parking garage says the cost to park is $10 Sunday through Wednesday and $15 Thursday through Saturday. But most DC government employees pay a $6.46 daily rate and some park for free with unauthorized parking decals. Image by the author. Despite its goals of reducing car commuting and carbon emissions, the District of Columbia is undercharging hundreds of DC government employees for workplace parking and allowing hundreds more not to pay for their parking spaces at all, a new report from the Office of the DC Auditor shows. Currently about 40% of DC residents drive to work. The city is trying to cut that down to 25% while bumping transit ridership up to 50% and walking and bicycling to 25% of trips. 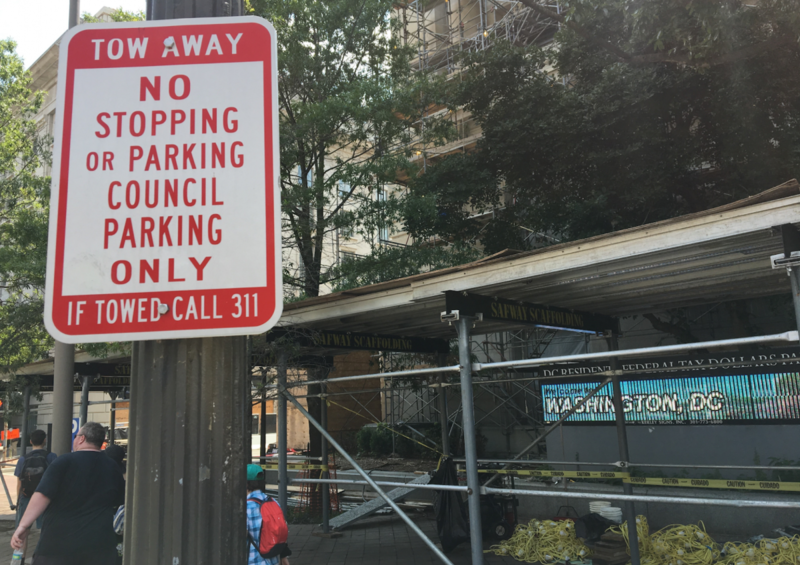 Free parking incentivizes the wrong thing: a Metropolitan Washington Council of Governments study shows that 73% of residents who have free parking at work choose to drive, compared to 23% of those without free parking. DC’s Worksite Parking Program charges most government workers who participate $140 a month for a parking space, which works out to $6.46 a day. The program brings in just over $2 million a year. The $140 fee has not increased since 2010. The auditor’s analysis found the $140 government rate is 39% lower than the market rate for monthly parking. “These low rates may be providing incentives for employees to drive to work, which contradicts the District’s environmental and energy goals which are to foster mass transit commuting, reduce greenhouse gas emissions, and create a more sustainable environment,” the report found. A total of 1,034 parking spaces are available through the program, with employees paying through deductions from their biweekly paychecks. At the same time hundreds of DC employees pay $140 a month to park at work, hundreds more pay nothing for their parking spots. There are 1,339 free spaces at 36 buildings leased by the DC government. In addition, 151 spaces are free to DC councilmembers and other employees at the John A. Wilson Building on Pennsylvania Avenue NW. Another 232 free parking spaces are at the Unified Communications Center, which houses 911 operators and others who work at the facility on Martin Luther King Jr. Avenue SE. Only DC’s 13 councilmembers are allowed to park on the block of Pennsylvania Avenue in front of the Wilson Building. They do not pay for the privilege. Image by the author. The auditor estimates that charging employees the regular DC government rate for the 1,722 currently-free parking spots would generate $2.2 million a year. If market rates were charged for all employee parking spaces owned or leased by the DC government, it would total $4.4 million in additional revenue. Four government agencies have decided to cover the cost of their employees’ parking spaces. But payments have not been collected from two of them – the Department of Health Care Finance and the Department of Forensic Science – costing $112,380, according to the report. “There are a whole host of management concerns. The program is not well run. It needs to be improved in terms of oversight,” Patterson said. The Metropolitan Police Department manages its own employee parking program at the Henry J. Daly Building police headquarters on Indiana Avenue NW, across the street from the Judiciary Square Metro station. The audit found that in two sections of the building’s parking garage, 158 of 175 spaces were given to employees for free, costing taxpayers $265,440 a year. At Metropolitan Police headquarters, many of the building’s parking spaces are taken up by employees parking personal vehicles for free. Image by the author. 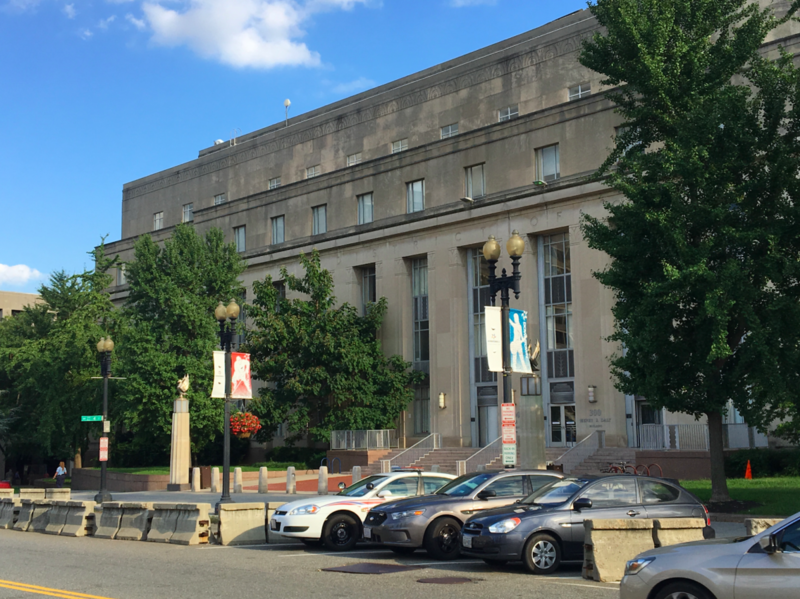 At the Franklin D. Reeves Municipal Center at 14th & U Streets NW, one block from the U Street Metro station, the audit found that the Department of General Services provided three free parking spots to contractors, costing $1,680 per space per year. But, according to the audit, there are bigger parking problems at the Reeves Center. 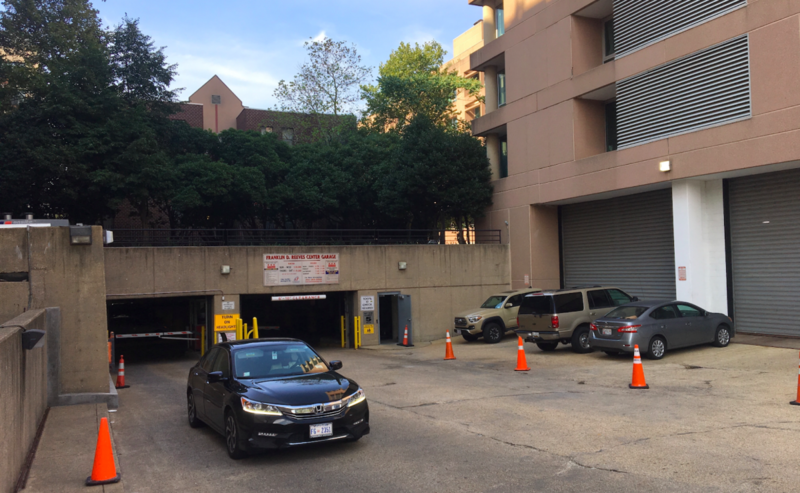 The parking manager who runs DC’s Worksite Parking Program issued 39 unauthorized “facilities decals” that the auditor says granted people access to the Reeves Center parking garage without paying. Employees from the Office of the DC Auditor say that on five separate occasions they photographed the parking manager’s personal vehicle parked in the garage with a special “facilities decal” that he had not paid for. The Department of General Services runs the employee parking program. The department’s public information officer declined to respond to questions about the program. The auditor’s report recommended that the special decals be discontinued. In its response to a draft copy of the auditor’s report, the Department of General Services disagreed with that recommendation. DC’s environmental and transportation priorities include expanding transit, bicycling, walking while reducing single-passenger auto trips on roads like the 10-lane Southeast/Southwest Freeway. Image by the author. “Free” parking is actually very expensive for cities, both in terms of the fees associated with the spot itself and the price that increased pollution and time spent waiting in traffic exacts on others. The idea of charging all government workers for parking is not new. In February 2012, the One City Performance Review initiated under Mayor Vincent Gray found that if all employees paid for parking, taxpayers would save $10 million over five years. Free and subsidized parking is at odds with DC's goals of reducing traffic congestion; encouraging commuting by transit, walking, and biking; and decreasing the greenhouse gas emissions that cause climate change. If the District really wants to move toward a more sustainable future, it needs stop paying for driving and incentivize transit, bicycling, and walking instead.